where the vicar’s tea is going to cause quite a stir! Has the Sorcerer added a dash of magic to the pot? Is there trouble brewing? Is it all a storm in a teacup, or something much more exciting …? Early Birds tickets until 24 May 2019! Book early to avoid disappointment! For more information and tickets, see the BLOC website. 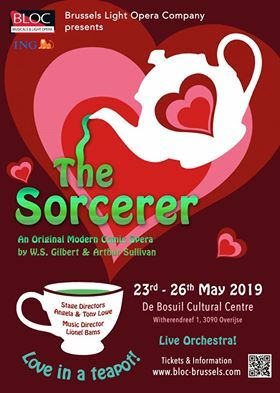 This entry was posted in 2018-2019, Brussels Light Opera Company, Tickets, Upcoming Shows on 26 May, 2018 by barbara.